Thrombin, a serine protease that converts fibrinogen into fibrin in blood coagulation, has played a crucial role in hemostasis and thrombosis. Thrombin is activated from its zymogen, prothrombin, at the site of tissue injury by Factor Xa and its cofactor Factor Va in the presence of phospholipid membrane and calcium [1Fenton JW II. Thrombin specificity. Ann N Y Acad Sci 1981; 370: 468-95. [http://dx.doi.org/10.1111/j.1749-6632.1981.tb29757.x] [PMID: 7023326] , 2Suttie JW, Jackson CM. Prothrombin structure, activation, and biosynthesis. Physiol Rev 1977; 57(1): 1-70. [http://dx.doi.org/10.1152/physrev.1977.57.1.1] [PMID: 319462] ]. Thrombin is a common hemostatic drug used in surgical practice for over 100 years because of its simplicity and efficacy [3Diesen DL, Lawson JH. Bovine thrombin: History, use, and risk in the surgical patient. Vascular 2008; 16(Suppl 1): S29-36. [PMID: 18544303] ]. Thrombin is present in fibrin glue (also known as fibrin sealant or fibrin tissue adhesive), a plasma-derived hemostatic agent that is composed of thrombin, fibrinogen, and sometimes factor XIII and antifibrinolytic agents. This agent mimics the final steps of the physiological coagulation cascade to form a fibrin clot. Fibrin glue is an effective tissue adhesive used for reducing blood loss in a variety of surgical specialties, and it is biocompatible and biodegradable [4Radosevich M, Goubran HI, Burnouf T. Fibrin sealant: Scientific rationale, production methods, properties, and current clinical use. Vox Sang 1997; 72(3): 133-43. [http://dx.doi.org/10.1159/000461980] [PMID: 9145483] -9Jackson MR. Fibrin sealants in surgical practice: An overview. Am J Surg 2001; 182(2)(Suppl. ): 1S-7S. [http://dx.doi.org/10.1016/S0002-9610(01)00770-X] [PMID: 11566470] ]. In addition, thrombin in the form of test reagents has been used for two types of blood coagulation tests: 1) fibrinogen level test; and 2) thrombin time test. Fibrinogen is measured in plasma most commonly using the Clauss method, based on the comparison of thrombin clotting times of dilutions of plasma against a reference plasma with a known level of fibrinogen. Thrombin time (or thrombin clotting time) is a widely performed coagulation assay, which evaluates the ability of fibrinogen to be converted into fibrin after the addition of bovine or human thrombin reagent to the citrated plasma [10Undas A. Determination of fibrinogen and thrombin time (TT). Methods Mol Biol 2017; 1646: 105-10. [http://dx.doi.org/10.1007/978-1-4939-7196-1_8] [PMID: 28804822] -12Ignjatovic V. In: Monagle P, Ed. Thrombin Clotting Time. Haemostasis. Methods in Molecular Biology (Methods and Protocols). Humana Press: Totowa, NJ 2013; pp. 992. [http://dx.doi.org/10.1007/978-1-62703-339-8_10] ]. Thrombin is isolated from plasma obtained from bovine or human sources [13Norton JA, Barie PS, Bolinger RR, Chang AE, Eds. Surgery: Basic Science and Clinical Evidence, 2nd ed. Springer, New York 2008; pp. 2334. [http://dx.doi.org/10.1007/978-0-387-68113-9] ]. The plasma is processed through a series of separation and filtration steps followed by incubation of the solution with calcium chloride to isolate and activate prothrombin to thrombin [13Norton JA, Barie PS, Bolinger RR, Chang AE, Eds. Surgery: Basic Science and Clinical Evidence, 2nd ed. Springer, New York 2008; pp. 2334. [http://dx.doi.org/10.1007/978-0-387-68113-9] ], it is also well known that prothrombin can be activated by some components of snake venom to yield thrombin [8Ngai PK, Chang JY. A novel one-step purification of human alpha-thrombin after direct activation of crude prothrombin enriched from plasma. Biochem J 1991; 280(Pt 3): 805-8. [http://dx.doi.org/10.1042/bj2800805] [PMID: 1764042] ]. The solution subsequently undergoes ultrafiltration, vapor heat treatment, solvent-detergent treatment, sterile filtration and freeze-drying [14Ham SW, Lew WK, Weaver FA. Thrombin use in surgery: An evidence-based review of its clinical use. J Blood Med 2010; 1: 135-42. [https://doi.org/10.2147/JBM.S6622]. [PMID: 22282693] ]. The large-scale production of thrombin from blood plasma (batch size 1200 liters) with a high degree of virus safety can be carried out by these following steps: 1) Isolating prothrombin by the following separation techniques: cryoprecipitation, ion-exchange chromatography (diethyl amino ethyl, DEAE-IEX), heparin affinity chromatography, a second DEAE-IEX step, and Immobilized Metal-Affinity Chromatography (IMAC); 2) Activating prothrombin to thrombin, purifying by Hydrophobic Interaction Chromatography (HIC) and concentrated by ultrafiltration; 3) Reducing viral activity by using substantially different techniques, namely: solvent/detergent (S/D) treatment, pasteurization, and virus filtration (nanofiltration) [15Aizawa P, Winge S, Karlsson G. Large-scale preparation of thrombin from human plasma. Thromb Res 2008; 122(4): 560-7. [http://dx.doi.org/10.1016/j.thromres.2007.12.027] [PMID: 18329699] ]. Russell’s viper venom factor X activator (RVV-X) is a major procoagulant in Russell’s viper venom. It is a glycoprotein containing 13% carbohydrate with a molecular mass of approximately 93,000 Da, and is composed of a heavy chain (RVV-XH) of molecular mass 58,000 Da and two light chains (RVV-XL) of heterogenous molecular mass 19,000 and 16,000 Da. It directly activates factor X in the final common coagulation pathway, which leads to rapid formation of blood clots [16Suntravat M, Nuchprayoon I. Recombinant Russell’s viper venom-factor X activator (RVV-X)-specific antibody: Neutralization and crossreactivity with Cryptelytrops albolabris and Calloselasma rhodostoma venoms. Asian Biomed 2011; 5(3): 371-9. [https://doi.org/10.5372/1905-7415.0503.048].]. Since purified RVV-X from Russell viper (Daboia russelli siamensis) venom can be prepared at the Snake Bite and Venom Research Unit, Faculty of Medicine, Chulalongkorn University, Thailand [17Suntravat M, Nuchprayoon I, Pérez JC. Comparative study of anticoagulant and procoagulant properties of 28 snake venoms from families Elapidae, Viperidae, and purified Russell’s viper venom-factor X activator (RVV-X). Toxicon 2010; 56(4): 544-53. [http://dx.doi.org/10.1016/j.toxicon.2010.05.012] [PMID: 20677373] ] and it can be used for prothrombin activation. This study aims to investigate a simple method with the optimum condition for rapid thrombin preparation from human CDP using RVV-X to activate prothrombin in the process. CDP, the plasma from which cryoprecipitate has been removed, was obtained from Blood Components Production Section, National Blood Centre, Thai Red Cross Society (NBC-TRCS). For the preparation of CDP, a unit of citrated whole blood was spun using a heavy spin in the centrifuge, and the plasma was removed within 6 hours after collection. Fresh Frozen Plasma (FFP) was then prepared by snap freezing the plasma unit at -70 oC and stored at below -30 oC. FFP was slowly thawed overnight at 4°C and centrifuged to separate the cryo-supernatant from the insoluble cryoprecipitate. The insoluble cryoprecipitate was removed and the remaining plasma (CDP) was refrozen. RVV-X, obtained from Snake Bite and Venom Research Unit, Faculty of Medicine, Chulalongkorn University, Thailand, was purified from crude Daboia russelli siamensis venom by a modification of the procedure of Kisiel et al. (1976) [18Kisiel W, Hermodson MA, Davie EW. Factor X activating enzyme from Russell’s viper venom: Isolation and characterization. Biochemistry 1976; 15(22): 4901-6. [http://dx.doi.org/10.1021/bi00667a023] [PMID: 990251] ] using sequential column chromatography. The specific Factor Xa activity was 1.240 nkat/ng. Thrombin was prepared by a modification procedure of Biggs R. (1972) [19Biggs R. Human Blood Coagulation, Haemostasis and Thrombosis 1972; 587-601.]. The starting volume 100 ml of CDP was diluted to 1000 ml with distilled water, the pH was adjusted to 5.3 with 2% acetic acid and followed by centrifuge. The precipitate was dissolved in 25 ml of 0.85% sodium chloride and the pH was adjusted to 7.0 with 2% sodium carbonate. This was followed by the addition of 0.25 M calcium chloride with or without RVV-X, and incubated for full thrombin formation or without incubation. 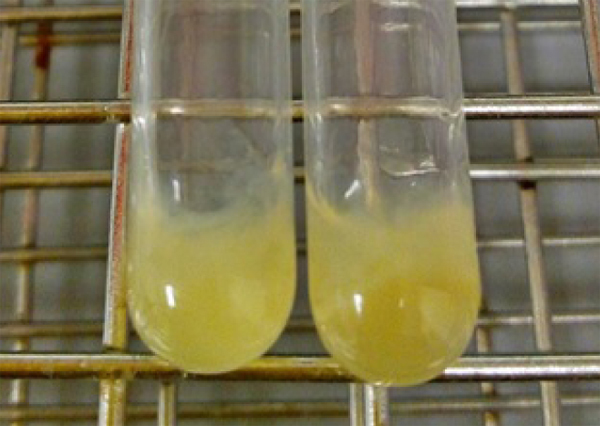 The coagulated fibrin was removed and acetone was added to the thrombin crude solution (volume 1:1) at room temperature to eliminate electrolytes and to denature some of the protein impurities [20Roche MN. Studies on blood coagulation (Master’s thesis, McGill University, Montreal, Canada) 1941. [cited 2018 May 11]. Available from: http://digitool.library.mcgill.ca/webclient/StreamGate?folder_id=0&dvs=1526884773042~562]. The solution was centrifuged to separate the precipitate. The precipitate was finally extracted with 0.85% sodium chloride and followed by centrifuge. The supernatant was collected as thrombin solution and stored in a freezer at a temperature below -20 °C for its stability before the properties were tested. Thrombin was prepared using the procedure described above in different conditions varying 4 related factors including: 1) RVV-X; 2) 0.25 M calcium chloride volume; 3) incubation time; and 4) 0.85% sodium chloride final extraction volume. The study compared different conditions step by step to determine the optimum preparing condition as the following methods: M1.0 vs. M2.0; M2.0 vs. M2.1; M2.0 vs. M2.2; and M2.0 vs. M2.3 (Table 1). The prepared thrombin was then further analyzed by different methods for the following properties: 1) fibrin clot formation; 2) total protein; and 3) Thrombin Clotting Time (TT). 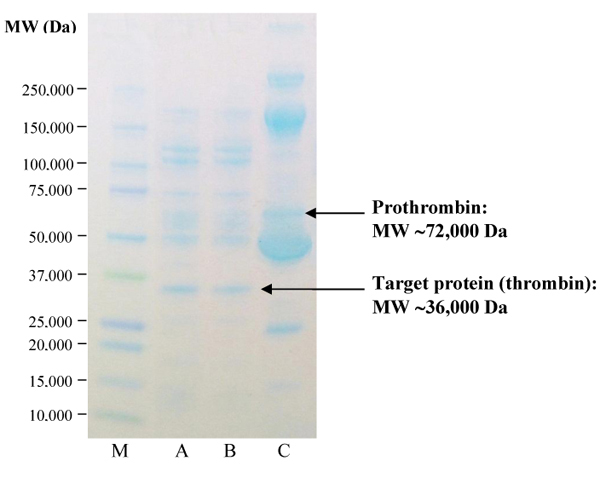 The prepared thrombin from two optimum conditions was analyzed and compared for: 1) Molecular Weight (MW) and protein patterns; and 2) thrombin concentration. Conditions used for thrombin preparation in the study. The prepared thrombin was preliminarily tested for its activity by observation of fibrin clot formation after mixing with cryoprecipitate (volume 1:1) obtained from Blood Components Production Section, NBC-TRCS. 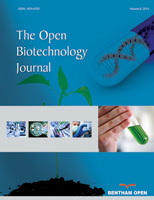 Kjeldahl method (determination of nitrogen by sulfuric acid digestion) was used for total protein assay of prepared thrombin according to the method described by European Pharmacopoeia 8.0 (2014) [21European Pharmacopoeia 80, Directorate for the Quality of Medicines & Healthcare of the Council of Europe Strasbourg: EDQM 2014; pp. 157.]. The prepared thrombin was diluted to 1:50 with distilled water. One hundred microliters of diluted thrombin was added to 100 microliters of fresh plasma in the test tube at 37 °C. The tube was gently shaken and tilted back and forth. The time taken for the first appearance of a fibrin clot was recorded. The Molecular Weight (MW) of the prepared thrombin was determined by sodium dodecyl sulfate-polyacrylamide gel electrophoresis (SDS-PAGE) using standard protein molecular weight markers. The prepared thrombin was determined by the automated coagulation analyzer (Sysmex® CA-560) compared to Japanese Pharmacopoeia Reference Standard Thrombin (690 units/ampoule, Control: THR0104) from the Society of Japanese Pharmacopoeia, for its activity in the International Units (IU/ml). Thrombin solution was prepared in different conditions and the properties of produced thrombin were compared step by step, in order to study the effects of four related factors in the thrombin preparation process. Prothrombin is the coagulation proenzyme present in the highest concentration blood (0.07-0.1 mg/ml) and was recognized very early as a prime contributor to the blood coagulation process [22Kenneth GM. In: Laszlo L, Ed. Prothrombin. Methods in Enzymology, Academic Press: New York 1976; 45: pp. 123-56. [https://doi.org/10.1016/S0076-6879(76)45016-4]]. By the common pathway, activated factor X (factor Xa) along with its cofactor (factor V), tissue phospholipids, platelet phospholipids and calcium forms the prothrombinase complex which converts prothrombin into thrombin [23Palta S, Saroa R, Palta A. Overview of the coagulation system. Indian J Anaesth 2014; 58(5): 515-23. [http://dx.doi.org/10.4103/0019-5049.144643] [PMID: 25535411] ]. In our study, factor X has been enzymatically activated by a coagulant protein (heterotrimeric metalloproteinase) [24Takeda S, Igarashi T, Mori H. Crystal structure of RVV-X: An example of evolutionary gain of specificity by ADAM proteinases. FEBS Lett 2007; 581(30): 5859-64. [http://dx.doi.org/10.1016/j.febslet.2007.11.062] [PMID: 18060879] ] in Russell's viper venom (RVV-X) to help make the conversion of prothrombin more complete than adding calcium to the plasma alone. The first study was conducted on the preparation of thrombin using Method M 1.0 and M 2.0 to compare the presence and absence of RVV-X in the preparation process. Thrombin was prepared from CDP (or cryo-supernatant), which is rich in prothrombin complex and has a low level of fibrinogen [25Prohaska W, Kretschmer V. Simple method for preparation of cryoprecipitate (CP) and cryodepleted plasma (CDP). Infusionsther Klin Ernahr 1984; 11(6): 342-4. [PMID: 6441780] , 26Sparrow RL, Simpson RJ, Greening DW. In: Greening D, Simpson R, Eds. A Protocol for the Preparation of Cryoprecipitate and Cryo-depleted Plasma for Proteomic Studies. Serum/Plasma Proteomics. Methods and Protocols, Humana Press: New York 2017; 1619: pp. 23-30.1619. ], by the procedure described in 2.3. From starting volume 100 ml of CDP, we obtained about 25 ml of thrombin solution in the preparation batch. The solution was slightly turbid with some small particles due to no filtration step in the preparation process. The preliminary test confirmed that there was thrombin in the prepared solutions, which can be observed from the reactions between thrombin and fibrinogen in cryoprecipitate to make the fibrin clot formation (Fig. 1 ). The appearance of fibrin clot after mixed the prepared thrombin with cryoprecipitate. Total protein content analyzed by Kjeldahl method showed that the thrombin solution of Method M2.0 had higher protein content than of Method M1.0, as well as the shorter thrombin time of Method M2.0 than of Method M1.0. At this step, we concluded that the use of RVV-X in Method M2.0 resulted in a greater amount of thrombin than that of Method M1.0 without RVV-X (Table 2). Properties of thrombin prepared by condition M1.0 and M2.0. The reaction of coagulant protein on factor X is proteolytic, has an absolute requirement for Ca (II), and proceeds at physiological pH [27Furie BC, Furie B. Purification of proteins involved in Ca(II)-dependent protein-protein interactions (coagulant protein of Russell’s viper venom). Methods Enzymol 1974; 34: 592-4. [http://dx.doi.org/10.1016/S0076-6879(74)34078-5] [PMID: 4449476] ]. In this study, 0.25 M calcium chloride was reduced by half to 1.5 ml to see how it affects the preparation of thrombin. At the half-dose of 0.25 M calcium chloride (Method M2.1), the total protein content of thrombin solution was lower than Method M2.0, and the thrombin time of Method M2.1 was twice longer than Method M2.0, indicating that the amount of thrombin prepared by Method M2.1 was much lower than of Method M2.0. In this step, it was suggested that the thrombin preparation process should have a sufficient amount of calcium in order to maximize the conversion of prothrombin (Table 3). This result corresponded to the previous study which indicated that prothrombin concentrates incubated with near-physiological levels of calcium appeared to correct the abnormal APTT to an increasing degree as the calcium concentration was increased [28Exner T, Rickard KA. The activation of prothrombin complex concentrates by calcium in vitro. Biomedicine (Paris) 1977; 27(2): 62-5. [PMID: 861352] ]. Properties of thrombin prepared by condition M2.0 and M2.1. For the next study, the different volume of 0.85% sodium chloride solution used to dissolve the final protein precipitate was compared between 25 ml (100%) in Method M2.0 and 10 ml (40%) in Method M2.2, to determine whether the sodium chloride extraction volume affected the properties of prepared thrombin or not. The total protein content of Method M2.2 thrombin solution was higher than that of Method M2.0, and the thrombin time of Method M2.2 thrombin solution was nearly twice shorter than that of Method M2.0. These results indicated that thrombin concentration of Method M2.2 was highly concentrated, therefore resulted in higher activity than Method M2.0 (Table 4). Properties of thrombin prepared by condition M2.0 and M2.2. After the first three studies on RVV-X, calcium and sodium chloride final extraction volume, the most appropriate method for producing thrombin was Method M2.2 (using RVV-X 50 mcg, 0.25 M calcium chloride 3 ml, 0.85% sodium chloride volume 10 ml for final extraction, and incubation time 2 hours) as it gave the highest total protein and lowest thrombin time. The next step was to compare the incubation time factor between Method M2.2 (incubation time 2 hours) and M2.3 (no incubation time) to determine whether thrombin can be generated without incubation time. Theoretically, the RVV-X, a factor X activator, is capable of promptly converting prothrombin into thrombin [29Vacca JP. In: Bristol JA, Ed. Thrombosis and Coagulation. Annual Reports in Medicinal Chemistry, Academic Press: San Diego 1998; 33: pp. 81-90. [https://doi.org/10.1016/S0065-7743(08)61074-X]]. Therefore, it was expected that Method M2.3 would result in thrombin amount not different from that of M2.2. The results showed that the total protein content of thrombin solutions including the thrombin time of Method M2.2 and M2.3 was very similar. However, the preparation process of Method M2.3 was more convenient as it did not require incubation time up to 2 hours (Table 5). Properties of thrombin prepared by condition M2.2 and M2.3. The MW of the prepared thrombin from two optimum conditions (Method M2.2 and M2.3) and diluted CDP were determined by SDS-PAGE using standard protein molecular weight markers (Fig. 2 ). From SDS-PAGE results, CDP contained several proteins including 72,000 Da prothrombin (lane C). Upon activation with calcium and RVV-X, 36,000 Da protein band which is the size of thrombin protein, appeared (lane A and B) [30Jenny NS, Lundblad RL, Mann KG. In: Coleman RW, Marder VJ, Alexander WC, George JN, Goldhaber SZ. Eds. Thrombin. Hemostasis and Thrombosis: Basic Principles and Clinical Practice, 5th ed. Lippinott Williams & Wilkins: Philadelphia 2006; pp. 193-213., 31Davie EW, Kulman JD. An overview of the structure and function of thrombin. Semin Thromb Hemost 2006; 32(Suppl. 1): 3-15. [http://dx.doi.org/10.1055/s-2006-939550] [PMID: 16673262] ]. Thrombin bands on the digest of Method M2.2 (lane A) and Method M2.3 (lane B) had a similar intensity even without incubation process in Method M2.3 due to the ability of RVV-X in activated prothrombin into thrombin promptly. At this stage, thrombin concentration has been tested using a coagulation analyzer by comparison with the standard thrombin, and reported as a thrombin unit. It was found that the thrombin concentration of Method M2.2 and M2.3 was 269.4 and 295.2 IU/ml, respectively, which indicated that Method M2.3 was the most rapid preparation method to produce thrombin and gave the highest yield of thrombin as well (Table 6). Properties of thrombin prepared by condition M2.3 and M2.4. SDS-PAGE of produced thrombin prepared from two optimum conditions. Lane M: molecular weight markers; Lane A: condition A (method M2.2); Lane B: condition B (method M2.3); Lane D: diluted CDP (10x). The method and process of preparing thrombin and the study of optimum condition for rapid preparing the highest yield of thrombin from starting CDP 100 ml were introduced. The best four conditions were concluded: 1) RVV-X 50 mcg should be present in the process; 2) volume of 0.25 M calcium chloride should be 3 ml; 3) volume of 0.85% sodium chloride for the final protein precipitate extraction should be 10 ml and 4) no incubation time needed for prothrombin activation process. The solution prepared from the optimum condition showed an obvious band on SDS-PAGE at a molecular weight about 36,000 Da which is our target protein thrombin. The prepared solution had a total protein content of 0.065 g/dl and gave satisfactory results of thrombin time (9 seconds) and fibrin clot formation. Testing comparison of thrombin concentration between the method with and without incubation time was carried out on a coagulation analyzer, and the results were 269.4 and 295.2 IU/ml, respectively. This result showed that the method with RVV-X but without incubation time for prothrombin activation (optimum condition) gave the highest yield of thrombin. The prepared thrombin should be further purified with suitable affinity chromatography for higher purity and potency in the next study. This research was approved by the Institutional Review Committee of the National Blood Centre, Thai Red Cross Society. The authors would like to acknowledge the Antiserum and Standard Cells Production Section of NBC-TRCS for providing equipment and instruments for our research with excellent facilities. We also would like to extend our sincere thanks to the Quality Control Section of NBC-TRCS for testing results in this study. Suntravat M, Nuchprayoon I. Recombinant Russell’s viper venom-factor X activator (RVV-X)-specific antibody: Neutralization and crossreactivity with Cryptelytrops albolabris and Calloselasma rhodostoma venoms. Asian Biomed 2011; 5(3): 371-9. [https://doi.org/10.5372/1905-7415.0503.048]. Biggs R. Human Blood Coagulation, Haemostasis and Thrombosis 1972; 587-601. European Pharmacopoeia 80, Directorate for the Quality of Medicines & Healthcare of the Council of Europe Strasbourg: EDQM 2014; pp. 157. Sparrow RL, Simpson RJ, Greening DW. In: Greening D, Simpson R, Eds. A Protocol for the Preparation of Cryoprecipitate and Cryo-depleted Plasma for Proteomic Studies. Serum/Plasma Proteomics. Methods and Protocols, Humana Press: New York 2017; 1619: pp. 23-30.1619. Jenny NS, Lundblad RL, Mann KG. In: Coleman RW, Marder VJ, Alexander WC, George JN, Goldhaber SZ. Eds. Thrombin. Hemostasis and Thrombosis: Basic Principles and Clinical Practice, 5th ed. Lippinott Williams & Wilkins: Philadelphia 2006; pp. 193-213.